Vanuatu’s leading island resort is heading into 2019 with a new accommodation package offering that promises to make a positive impact on travel to the small island nation, located just three and a half hours fly time from Auckland. For the first time, Holiday Inn Resort Vanuatu is offering all-inclusive accommodation packages, marking this an exciting time for resort guests travelling to Vanuatu in 2019 and beyond. 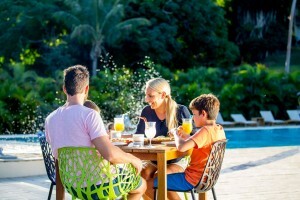 Resort General Manager, Matthew Senyard, said they created the packages to respond to consumer demand and those seeking a convenient pre-paid holiday. Guests can book an all-inclusive Vanuatu holiday and take comfort in knowing exactly what they are receiving, before arriving at the Resort. As a base, all the new packages include accommodation, breakfast and dinner. From here you can add layers of value adds. The entry package includes accommodation, with daily breakfast and dinner, and is called ‘Half Board’. Next in line is the ‘Full Board’ package, which includes accommodation, daily breakfast, lunch and dinner. Finally, the ‘All-Inclusive’ package includes accommodation, daily breakfast, lunch and dinner, PLUS unlimited drinks. Mr Senyard said the Resort had already had an outstanding response to the packages. “We conducted a soft launch of the packages late last year with selected travel agent partners to test the market. To date, the response has been fantastic, which has encouraged us to launch the packages to the public,” he said. “It is another step in our commitment to providing a relaxing, stress-free holiday for our guests in one of the world’s most idyllic locations. We are providing an all-inclusive accommodation package for one price, which enables guests to just relax and indulge knowing all their Resort accommodation, food and beverage expenses are taken care of – no surprises! Mr Senyard said the Resort has been voted the #1 Family Resort in the South Pacific by Holidays with Kids magazine readers – an accolade the Resort is very proud of. Guests travelling on the all-inclusive packages will enjoy beautiful Melanesian style accommodation, and fantastic cuisine from any one of the three food and beverage outlets at the Resort, which include The Lobby Bar, The Pool Bar, and Verandah Restaurant. Located just minutes from town, with exclusive lagoon frontage, Holiday Inn Resort Vanuatu truly is an oasis in Port Vila and has become the South Pacific Resort of choice for island holiday-makers. The Resort boasts 148 guest accommodation rooms including themed family suites and unique overwater villas. Resort facilities include two stunning pool areas, a FREE kids club, day spa, nine-hole golf course, and three bar/dining outets – Verandah Restaurant, Lobby Bar and Pool Bar featuring its famous wood fired pizza oven. The Resort ‘Kids Stay and Eat Free’ program, kids club and an interactive kids’ pool area ensure that families enjoy a fun-filled holiday. There is also a complete activities program for all resort children, including teens. Couples looking forward to a romantic escape can enjoy the peaceful surrounds of the Terrace Pool area and make the most of the Resort’s private Erongo Island. To reserve an all-inclusive accommodation package at Holiday Inn Resort Vanuatu, visit their website or visit your favourite travel agent.